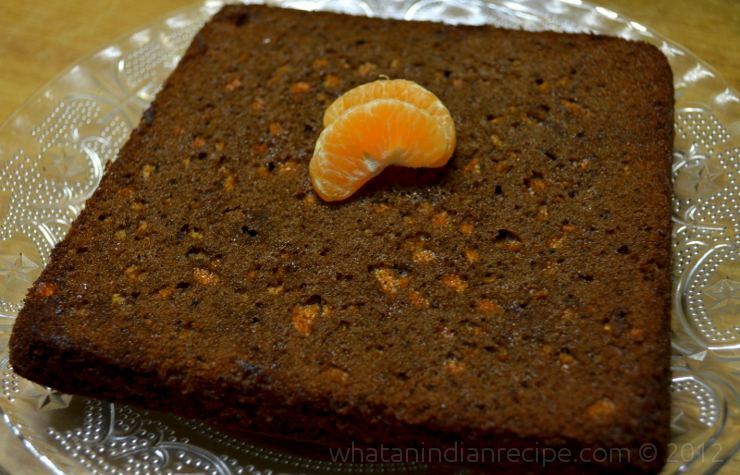 Chocolate Orange Cake is a yummy cake for chocolate lovers with the goodness of orange. It is a soft and chocolaty cake which will be loved by kids with just the right amount of orange flavour. Beat the eggs for 2 minutes till frothy . To this add the sugar and butter and beat again for 2 minutes. Now add the flour. cocoa powder and baking powder gradually and fold in with a wooden spatula and mix well. Finally add the orange juice and orange rind (click here to see how to prepare orange rind). Mix well. Grease a cake tin and Pour the cake mix. Preheat oven and then bake the cake at 180° C for about 30 minutes or till the cake is done.